Why fail to play certain MP4 files on WD TV? 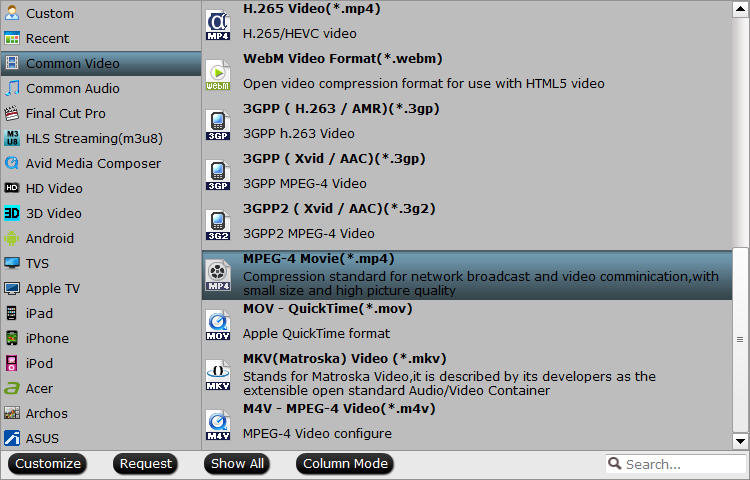 From WD TV supported file formats, we can see that although WD TV has included native playback support for MP4 files. However, for WD TV HD Media Player, only MP4 files encoded with MPEG-4 and H.264 codec are supported, as for WD TV Mini Media Player, only MP4 files encoded with MPEG-4 codec are supported. However, it is well known that MP4 is a multiple container file format, which can also be compressed with other video codec such as MPEG-1, MPEG-2, WMV/VC-1, H.265, MVC, etc that are not supported by WD TV. To get all MP4 files played on WD TV, what you need to do is to perform a format or codec transcoding process. 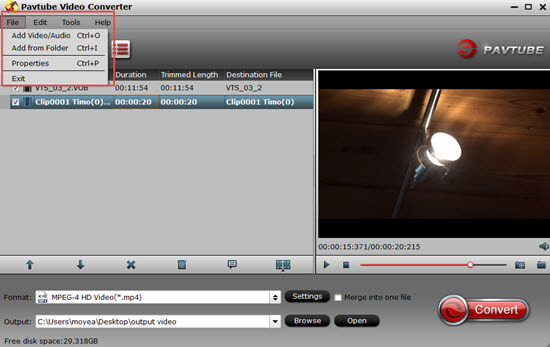 Here, you can get the job easily done with our powerful MP4 Video Converter - Pavtube Video Converter. The program has full support for all 4K/2K/HD/SD MP4 files encoded with various different compression codec including MPEG-1, MPEG-2, MPEG-4, MPEG-4 (A)SP, H.264, H.265, WMV/VC-1, MVC, etc. The program supports batch conversion mode, so that you can load multiple MP4 files into the application for conversion at one time. Our application is pretty simple to use, with just few clicks, you can efficiently produce WD TV playable MPEG-4 MP4 or H.264 MP4 file formats with super fast conversion speed and excellent output file quality. The program supports hard-ware encoding acceleration, you can get up to 6x faster H.264 codec encoding speed as long as you run you computer on Graphic cards that supports Nvidia CUDA or AMD App technology. Step 1: Imort unsupported MP4 files to the program. Launch the application on your computer, click “File” > “Load Video/Audio” or “Load from Folder” to import MP4 files to the program. 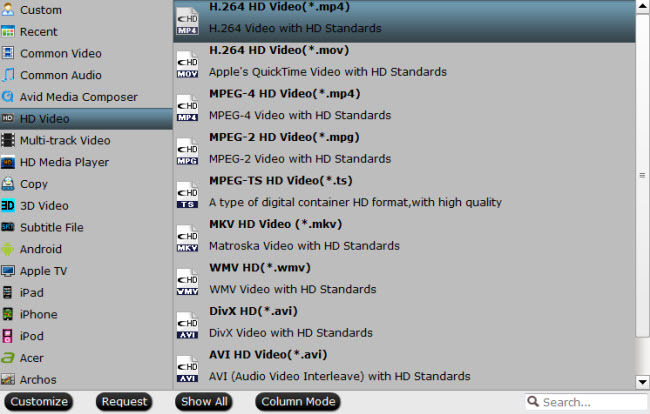 From “Format” drop-down list, select “HD Video > H.264 HD Video(*mp4)” as the output file format for playing on WD TV HD. As for WD TV Mini, it would be ideal for you to choose “MPEG-4 Movie(*.mp4)” under “Common Video” main category. 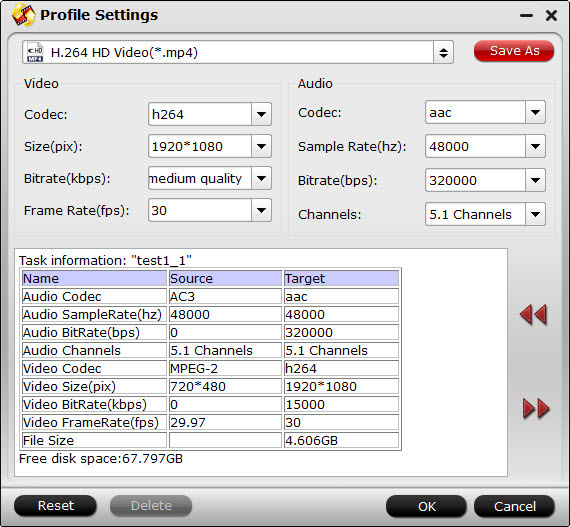 Click “Settings” to open “Profile Settings” window, you can flexibly adjust output profile parameters including video codec, resolution, bit rate, frame rate, audio codec, bit rate, sample rate, channels, etc as you like to get better output video and audio quality. Step 4: Begin the final conversion process. Clicking the Convert button in the right-bottom on main interface to start MP4 to WD TV conversion process, a conversion window will pop out with the detailed conversion information such as Time elapsed, Time left, Generated size, and Estimated size.